If you think of a puny, 3,000-lb. Toyota Prius when someone says "hybrid," watch out for the U.S. Navy's version: a 40,000-ton behemoth carrying attack planes, helicopters, missiles and more than 1,000 Marines. Much like the Prius, the new 844-ft. U.S.S. 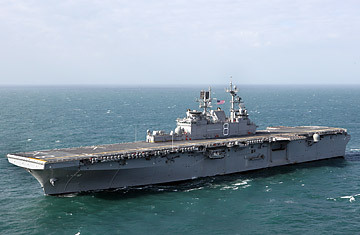 Makin Island is powered by thirsty gas-turbine engines for top speeds but uses electrical motors for slower travel. Navy Secretary Ray Mabus raved about the new vessel last week, saying its ability to sip fuel rather than gulp it gives the Navy more punch while making it less vulnerable to unfriendly nations that are turning off the oil spigot. "The whole notion is to make us better war fighters and to quit buying as much energy from potentially volatile places on earth  places that maybe we shouldn't depend on," he said. Ships that need less fuel also aren't tethered as tightly to the oilers that refuel them, giving them added flexibility. "Our military leaders recognize the security imperative of increasing the use of alternative fuels, decreasing energy use, reducing our reliance on imported oil, making ourselves more energy-efficient," President Obama recently said. "It's about the future of our planet." Even normally skeptical outsiders have been impressed. The Pentagon "has enacted energy goals and is inventing, testing and deploying new technologies and alternative fuels to meet those goals," according to Phyllis Cuttino, director of the Pew Charitable Trusts' climate and energy programs. "The military is, in many respects, leading the way and helping to re-energize America's future." The Navy wants to deploy a "Great Green Fleet" by 2016, with all the task force's ships and aircraft powered by nuclear, electric or biofuel. Last week, a Navy F-18  dubbed the Green Hornet  flew for the first time on a 50-50 mixture of standard jet fuel (about $3 a gallon) and camelina oil ($65 a gallon), an extract from the camelina plant, part of the mustard family, which is grown in Montana. The price of camelina oil will drop as demand for the fuel increases, Navy officials say. The Navy has debated such power shifts before  it was steam vs. sail nearly 150 years ago. The service's top admiral kept sails paramount by warning his officers that they would personally have to cover the cost of coal burned to power steam engines aboard ships that also had sails. After the U.S.S. Wampanoag showed the wonder of steam power  her captain called her the "fastest in the world" after she cruised at 16 knots for 38 hours through mostly heavy seas in 1866  a board of naval officers dismissed the achievement. Sailors  the word itself speaks of the power of wind  working in engine rooms out of the view of their captain are a "poor substitute for the school of observation, promptness and command found only on the deck of a sailing vessel," the barnacle-clad panel ruled. The Wampanoag was a "sad and signal failure" that couldn't be made fit for the Navy because it was "too much of an abortion," the officers concluded. It would be 15 years before the Navy built another steam-powered ship. So when might the entire Navy take the next big step and go all nuclear? Currently, about 17% of the fleet  aircraft carriers and submarines  are powered by small nuclear reactors. Mabus noted that the cost of nuclear propulsion goes well beyond the price of the reactors and includes costly infrastructure and training ashore. "To make the economic case" for nuclear-powered ships, he said, "oil has to be $150 a barrel over a sustained period of time." In that case, let's hope the Navy is satisfied with hybrids for decades to come.